These keto tortillas will lessen your desire for bread and pasta. Of course, taste is a little different, but unlike regular tortilla, these keto tortillas contain little carbohydrate. And this fact is important for us. The second relevant fact is that they are Paleo, low-carb, keto, sugar-free, dairy-free, egg-free, grain-free, gluten-free, and low-calorie. So they are perfect for vegan and diabetes nutrition. Note: You can make 10 regular tortillas (8 inches), or 5 large tortillas (12 inches ). Place the flax seeds, coconut flour, almond flour and psyllium husks into a bowl. For best results make sure you use whole psyllium husks. 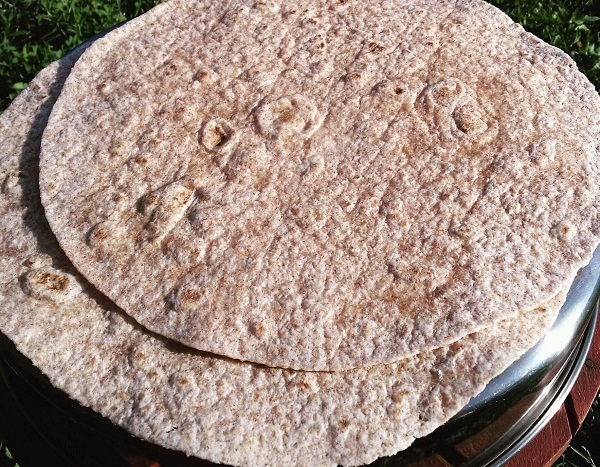 Using whole husks makes the tortillas more compact and flexible. Add any of your favorite seasonings. Add the ground chia seeds. To grind them, use a blender and pulse until powdered. Pour in the water and mix until well combined using your hands. If needed, add a few more tablespoons of water. Be careful not to use too much, or the dough will get too sticky and difficult to roll. Let the dough rest in the fridge or on the kitchen counter for up to an hour. Remove from the fridge and cut the dough into 6 equal pieces. Place a piece of the dough between two pieces of baking paper and roll out until the dough is very thin. Alternatively, use a nonstick silicon covered roller and a silicon mat. Use an 8-inch lid or bowl to cut out the tortillas. Repeat with the remaining dough and the cut off until you get 10 tortillas. If you have any dough left, use it for making nachos. Preheat a heavy-bottom pan greased with just 1 teaspoon of ghee or lard. Therefore, place the tortillas, one at a time, on top of the hot pan and cook over a medium heat on one side for 1-2 minutes until lightly browned. Turn on the other side and cook for 30-60 more seconds. Note: Don’t overcook or the tortillas will become too crispy and will lose their flexibility. Grease more when needed and repeat for the rest of the tortillas. Can I Pin this? I love your Tortilla’s ! Of Course 🙂 I’m glad to hear that. Do you suppose ground chia seed could substitute for the flax? Thank you! Do you think there is a substitute for the psyllium husks? You can use xantham gum instead of Psyllium Husk. 1 teaspoon Xanthan gum will work. Those are gorgeous tortillas! I’ve never cooked with psyllium husks. What other low carb recipes do you use it in?